NOTE: For A/T models (see page 14-188). 1. Disconnect the output shaft (countershaft) speed sensor 3P connector (A). 2. 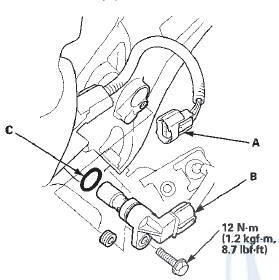 Remove the output shaft (countershaft) speed sensor (B). 3. Install the parts in the reverse order of removal with a new O-ring (C).